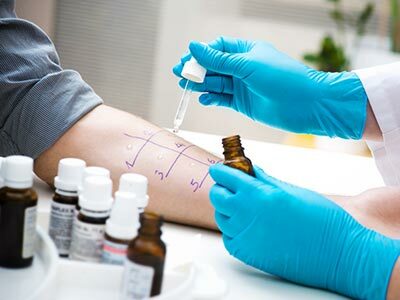 Allergy testing: Do you suffer from allergies? Stuffy nose, itchy eyes, difficulty breathing, coughing and sneezing? If you have any of these symptoms means you may need an allergy test. Nearly every third American suffers from allergies. Allergies are the most common disorder of the immune system where the body is reacting to generally harmless substances. Those substances are called allergens. The immune system in touch with these substances releases chemicals that cause allergy symptoms. There is a broad spectrum of allergy types and their symptoms. Based on the type of allergens, the substance that causes the reactions, there are food allergies, seasonal allergies, pet allergies, and others. Nearly everyone at some point will experience one of these allergy types. Food allergies or food intolerance are followed by many unpleasant reactions such as skin rash, itch, severe cough, and wheezing. If any of these reactions occur you should immediately visit the doctor since food allergies are very serious and could become severe if not treated properly. Most common food allergies are eggs, nuts, milk, peanut, fish, shellfish, strawberry and tomatoes. Seasonal and pet allergies are less dangerous than food allergies Even though seasonal allergies can effect people through the entire year, the most common allergic reaction will occur in spring time. Both types will have similar symptoms such as sneezing, runny nose, watery eyes and skin rash caused by pets hair. Allergies are successfully treated with either medication or simply allergens avoidance. After identified by the doctor, the best way to protect yourself is simply to stay away from the allergy source. If treated with medications, depends on what type of allergy, there are epinephrine, antihistamines, decongestants, steroids and topical treatments. All these medications slow down and decrease allergic reactions. Medications can be prescribed by the doctor or bought over the counter. However, people should never treat themselves with medications before seeing the doctor and have allergies diagnosed by the doctor. Allergy testing is done in the doctor’s office by having blood, nasal or skin test performed. Allergies are a very common immune disorder that affects more and more people each day. Luckily all allergies are successfully controlled and treated with different medications. Depends on the allergy type, reactions can be mild, moderate or severe. Some allergies such as food allergy are followed by severe reactions and can be very dangerous. In Century Medical and Dental Center (Downtown Brooklyn, Gravesend and Flatbush), our allergist together with the primary care doctor, successfully treats all allergy types for over ten years. Our primary care doctor will ask about patients signs and symptoms, allergy history and if any allergic reactions that patient was exposed to. If unable to diagnose the type of allergy, our allergist will perform one of the three most common allergy tests. In Century Medical and Dental Center (Downtown Brooklyn, Gravesend and Flatbush), our friendly stuff always welcome new patient and our doctors give the best possible care. Do you suffer from allergies? Come to Century Medical and Dental Center (Downtown Brooklyn, Gravesend and Flatbush) and have your allergies taken care of.